HOT FIREPol® Probe qPCR Mix Plus (no ROX) is optimized for real-time quantitative PCR assays using sequence-specific fluorogenic DNA-probe chemistries. The Mix contains all the components necessary to perform qPCR, with the exception of template, primers, and probe. The qPCR Mix contains optimized components and HOT FIREPol® DNA Polymerase supplied in a proprietary reaction buffer that enables detection of low copy number targets. HOT FIREPol®DNA Polymerase is activated by a 12 min incubation step at 95°C. This prevents extension of non-specifically annealed primers and primer-dimers formed at low temperatures during qPCR setup. 08-15-00001 1 ml 5x PDF PDF PDF 29 EUR Login to buy! 08-15-00008 8 ml 5x PDF PDF PDF 220 EUR Login to buy! 08-15-00020 20 ml 5x PDF PDF PDF 500 EUR Login to buy! 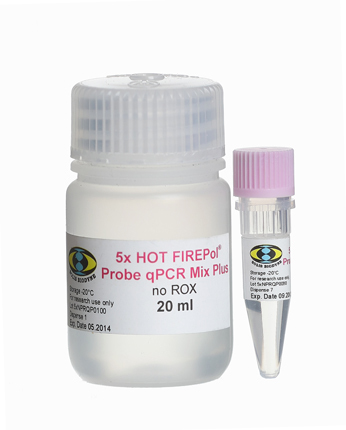 Shipping and temporary storage for up to 1 month at room temperature has no detrimental effects on the quality of HOT FIREPol® Probe qPCR Mix Plus (no ROX). Mastercycler is a trademark of Eppendorf AG. Rotor-Gene is a registered trademark of Corbett Research (Qiagen). CFX96, CFX384, iQ, MyiQ, Chromo4, Opticon 2, MiniOpticon are trademarks of Bio-Rad Laboratories. LightCycler is a registered trademark of Roche Applied Sciences. The Eco is registered trademark of Illumina Inc.